A stunning design joins an impressive array of specs and pleasing user experience to make this a phone that not only tops most within its price bracket, but many more expensive handsets too. Wileyfox was something of a surprise when it joined the smartphone race in 2015. A British firm that specialises in budget handsets, it seemed destined to disappoint from the off. Things didn’t work out that way though. Instead, it’s consistently impressed with a range of affordable phones that pack specs and designs well above their entry-level asking prices. Now there’s a new flagship device in this wallet-friendly phone lineup: the Wileyfox Swift 2 X. Building on the foundations of its superb sub-£200 sibling, the Wileyfox Swift 2 Plus, it’s a phone that’s made small but significant improvements to go head-to-head with the likes of the Lenovo P2, Moto G4 Plus and Honor 6X for the affordable phone crown. Available in the UK now with a £219.99 asking price, the Swift 2 X doesn’t look or feel cheap. Instead it pairs a solid specs sheet with a body that wouldn’t look out of place on a device twice the price. Is that enough to give it the edge over more established names such as Honor and Motorola though? Compromise isn’t a word you’d associate with the Wileyfox Swift 2 X; on the contrary, this is a smartphone that’s more than the sum of its parts. Rather than being based on a single hook or defined by a sole, standout feature or even its affordable price tag, the Swift 2 X merges together a collection of impressive components to create a phone that feels well-rounded and perfectly balanced. With 3GB of RAM and a Snapdragon 430 chipset, there’s power to get the job done without being over the top. The 5.2-inch screen is big and bright without making the phone cumbersome, and the 16MP camera, for the price, is hard to fault. This is a phone that feels better thought-out than many affordable devices. From its design to its Cyanogen-skinned take on Android, it’s got a sense of class and sophistication usually missing at this end of the price spectrum. It’s got some features that, although available on some entry-level devices aren’t exactly standard-issue, namely integrated NFC, which makes Android Pay a possibility, and an inbuilt fingerprint scanner. Due to the absence of a physical home button the scanner is located on the rear of the device, just beneath the camera lens. It’s a now-familiar location that works well and is always within easy reach – though it does mean picking the phone up if it’s sat face-up on a surface. Again showing a bit of thought over most entry-level phones, this isn’t a flaky, temperamental addition, shoehorned in simply as a mark in a check box either. The Swift 2 X’s scanner is pleasingly fast and responsive. We experienced minimal misreads, with even brief waves of the fingertip registering. 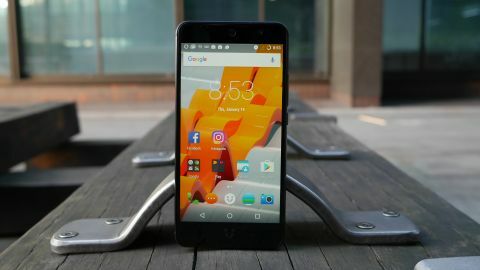 As an all-rounder, the Wileyfox Swift 2 X is a phone that shows consideration. The 32GB of integrated storage is double what the Moto G4 Plus offers, and on par with base-level flagship Android handsets. It’s not the cap, either, with microSD support up to 64GB also included. On looks alone, this is a phone that you’d expect to be running with Apple and Samsung. It’s not as easy on the eye as either the iPhone 7 or Samsung Galaxy S7 Edge – far from it – but next to flagship devices such as the LG G5 or Sony Xperia XZ it comfortably holds its own. The difference is that it costs just a third of the price. Overall, the Wileyfox Swift 2 X looks and feels fantastic, and not just for a phone available for around the £200 mark. Irrespective of price, it’s a well-designed, well-manufactured handset. The poorly pieced-together plastic you’d expect around this price point is gone. In its place you’ve got a smooth, metal frame that’s comfortable to hold and will have your friends looking on with envy. A subtle curve to the rear of the phone helps it sit snugly in your palm, while textured indents on the physical buttons – a sleep switch and volume toggle are located on the phone’s right edge – offer a bit of tactile grip, making them easy to locate without looking. Although the tapered edges and metal build give the phone an HTC 10 sort of look, there’s a slight discolouring between the phone’s back panel and its top and bottom plastic edges that will split opinion. A minor aesthetics issue, the Swift 2 X styles out this shortcoming, with each section having been slotted together perfectly with no rough edges or gaping cracks. At a reassuring 8.8mm thick, it’s fatter than the 8.2mm Honor 6X, but notably slimmer than the 9.8mm Moto G4 Plus. It holds its size well too. Unlike its closest rivals, Wileyfox hasn’t tried to go too big with the Swift 2 X, dodging the trend for 5.5-inch phones and sticking with a 5.2-inch panel that feels sizeable and immersive without dominating your hand. Yes, it’s bigger than the 5-inch Swift 2 Plus, but it’s also sharper. Its sibling’s 720p HD panel – one of the phone’s few stumbling blocks – has been ditched. In its place is a 1080 x 1920 offering that really pops. Colours are bright and vibrant, and the screen has a general warmth without being overblown. Video playback is smooth and there’s a pleasing depth to tones, while text is crisp and sharp. It’s not the best screen we’ve ever come across, but it’s a solid, well-rounded display that's a marked improvement on the company’s past phones. With a 424 pixels per inch image density, it’s actually marginally sharper than either the G4 Plus (401ppi) or Honor 6X (403ppi), although you’ll be hard-pushed to spot the difference. There’s no visible recession to the screen either, with in-cell technology putting the screen and toughened Gorilla Glass 3 in one to give it added punch. Screen brightness, usually a sacrificial lamb for affordable phones, is on point too. The phone’s screen is visibly the focus, with no physical buttons cluttering the device’s front. Instead its clean design utilises Android’s typical back, home and menu soft keys for navigation. A USB Type-C connection on the bottom handles charging and file-transfer duties. Bucking the current trend higher up the pay scale, the Swift 2 X has also retained its traditional 3.5mm headphone port for those who don’t mind cables while enjoying audio on the move. Unusually though, here's it's on the top of the phone rather than the bottom. If there’s one bad thing to say about the phone’s finish, it’s the LED notification light. It might sound small, but the light’s impact is big. Overly bright and offensive, it’s a room-lighting annoyance that’s an unnecessary oversight on an otherwise stunning handset.